F*CK CANCER! Yeah, I don't usually use such language as that, but in this case, I'll make an exception. I lost my father and my sister to this dreaded disease, I've trained and rode in a fund-raising campaign when my old and feeble body was barely up to the task, I've donated stories for Shawn Speakman's Unfettered books to help end his medical debt (and reduce the debts of other fellow authors), and now I'm joining with hundreds of fantasy authors to support one of our own. Brandon Barr is dying. Nothing can be done to stop that fact, but hopefully, we in the fantasy community can help bring a little peace of mind to him, by providing some financial support to the wife and three boys who he leaves behind. So, I've become one of #BrandonsBuddies, and I hope you will, too. How do you do so? 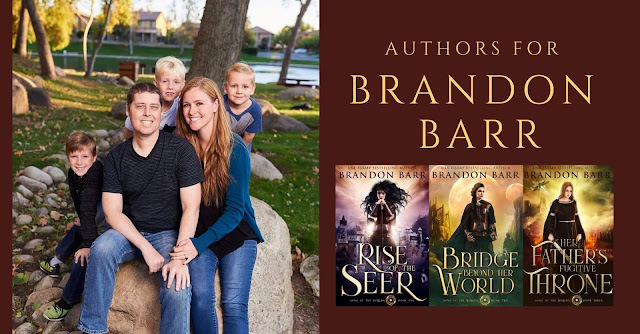 Why not pick up one (or several) of Brandon's books, Rise of the Seer has just been released at an introductory price of $0.99. You can join me in donating to Brandon's GoFundMe Campaign it's already raised more than 1/3 of it's $100,000 goal. You can help spread the word about Brandon, his work, and the horrific situation he finds himself in on Twitter, Facebook, and other social media sites. Please use the hashtag #BrandonsBuddies. So if you're looking for some great epic fantasy, and want to do some good at the same time, please get yourself a copy of one (or several) of Brandon's books. Not only will you get a great story but you'll be helping one of fantasy's own whos voice will be silenced way too soon. Hey all, I've been invited by the Angel Hayes at Indie Fantasy Addicts to be part of an online event today at 2:00. If you can't attend, I believe it's being recorded so you should be able to see all the happenings at a time of your convenience, and I'll update this post once the video is live. 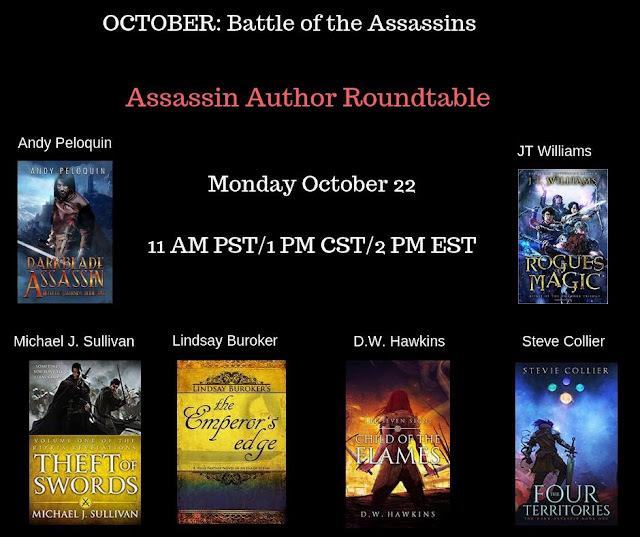 I'll be joining a number of fellow fantasy authors including Andy Peloquin, JT Williams, Lindsay Buroker, D.W. Hawkins, and Steve Collier. Not entirely sure what all we'll be discussing, but I'm sure it's going to be a lot of fun. So, if you're free, stop on by, and if you're not. Check out the video whenever you get a chance. Here is a link to the recorded session. A few weeks ago I posted about the Booknests' Fantasy Award, and how Age of War was picked by a panel to be one of the 50 titles submitted for consideration. The judges included nine popular fantasy blogs (Bookworm Blues, Fantasy Book Critic, Fantasy Book Review, Fantasy-Faction, Grimdark Magazine, The Fantasy Hive, The Fantasy Inn, The Grim Tidings Podcast, and The Weatherwax Report), three big fantasy imprints (Gollancz, Harper Voyager, and Orbit), and two well-respected agents (John Jarrold and Joshua Bilmes of JABberwocky Literary Agency). What an amazing list with some incredible books, and I was pleased to be included. What I didn't expect was to make the short list. After all, forty books had to go, and I expected mine would be one of them. But out of some miracle (and thank you to everyone who voted), the book made it to the shortlist. Once again, I'm including some data from Goodreads (which I've updated from my last post). The odds-on favorite would be Children of Blood and Bone although I won't count out how much people enjoy Brandon Sanderson's work. 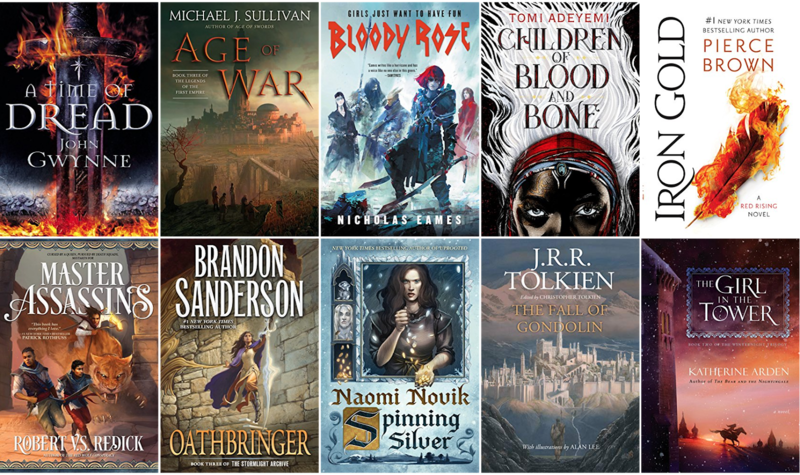 Voting is open for the next round, and again don't feel obligated to vote for Age of War (you'll just be throwing your vote away, but by all means, vote for whichever book you want to see win. In general, I don't do many conventions. It's not that I don't enjoy them, but travel can be trying (Robin has had two back surgeries and being on a plane for any extended period of time is painful, and I don't like going anywhere she doesn't come). Plus, unless the publisher is footing the bill, it can be pretty expensive. Don't get me wrong, I love to see fans, but if it's going to cost me several days of writing time and a few thousand dollars...well, you can see why I don't go to many conventions. But when an opportunity arose to go to the Lucca Comics and Games Convention in Italy...with all expenses paid by my Italian publisher and the convention organizers, how could I say no? Especially when they offered to pay for all of Robin's travel as well. If you don't know anything about the Lucca festival (I didn't until I was invited), here is a great video that gives you a good idea what we're going to be doing from October 31 - November 4th. The convention has been described as "the western world's biggest geek meet." It's huge! Over 500 events, concerts, parades, and activities are held in historical buildings and on the streets, taking over the entire city. In 2017 the festival celebrated its 51th anniversary, with more than 50 international guests and about 245,000 attendees. To put that into perspective, Dragoncon (held in Atlanta each year) has about 80,000 attendees, and New York Comic Con has about 130,000. Those conventions are dwarfed when compared to Lucca. Below is my convention schedule. If you are going to be at Lucca, please drop by and see me at any of these times. If you won't be attending the Lucca Festival, we can still meet up. I'll be in Florence on 10/30, 11/4, and 11/5 and a little bit on 11/6, and in the town of Lucca starting early on 10/31 and for a little bit on 11/4. Just drop me an email and let me know where and how you want to meet and we'll do the best we can to accommodate you. We did it--take that price gougers! If you follow this blog you may be aware of a little mission Robin and I set out on. You see, recently Del Rey put the hardcover edition of Age of Swords out of print, and the third-party resellers on Amazon had a field day, taking the $28 hardcover and jacking up the price to astronomical levels. 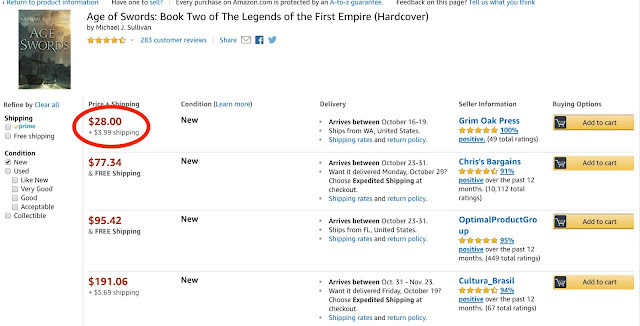 For instance, on 9/22 the prices for a new copy ran between $100.92 - $191.06. Now, for the people who had put off buying their copies of Age of Swords, this would mean a hole in their collections, and I didn't want to have that. So, Robin went to work to rectify the situation. Step 1 was getting our hands on as many copies of Age of Swords as we could, which would cut off the supply chain from the price-gougers. We could do it, but it'd be expensive...nearly $9,000. But we had to try. Step 2 was to run a crowdfunding campaign to raise the cash. We sold the first three books of the series at a 20% discount and provided people with bonus perks like bookmarks, screensavers, and a new Legends of the First Empire Short Story. The campaign raised more than $32,000 (more than enough to cover the buying, shipping, and storing of the books. Plus we sold more than 950 books in the process. Woohoo! Step 3 was to get the books on Amazon at $28. 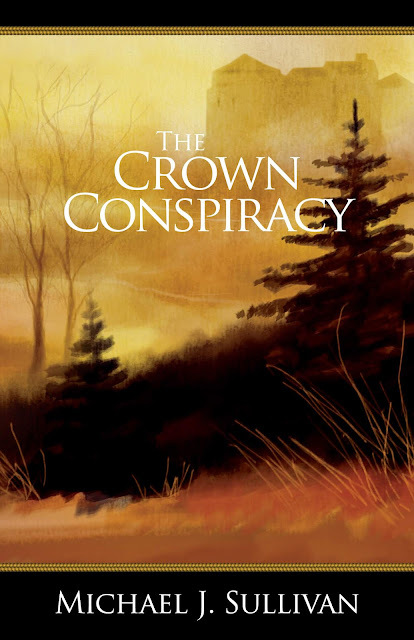 We turned to Shawn Speakman at Grim Oak Press (a great guy who've we worked with before on anthologies such as Unfettered, Unfettered II, and Unbound). Shawn already had an Amazon Marketplace account, so we shipped him a bunch of books at $10 a piece giving he a nice profit margin to earn well when people buy the books at the original list price of $28. And there you have it! The book is back to $28, readers won't have a hole in their Legends of the First Empire hardcover collection, Shawn will make some cash, we'll make some cash, everyone wins! Well, except for those poor, poor, price gougers who aren't going to be able to sell their books at those outrageous prices! My thanks to Del Rey, Shawn Speakman, Robin, and most important to you, dear readers, for helping to get this problem solved. We make a pretty good team! 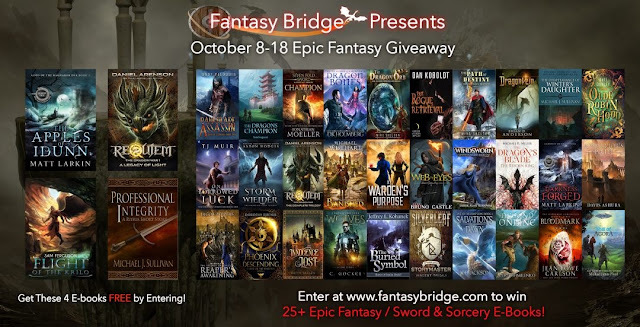 Hey all, I'm once more partnering up with Fantasy Bridge to be part of an Epic Fantasy Giveaway. You can enter here. All people who enter will receive 4 ebooks including my short story Professional Integrity. There will be 1 Grand Prize Winner and 5 Regular Winners. All six of these people will receive the 30 ebooks listed below. The Grand Prize Winner will also receive a $30 Amazon card. I really like the fact that there are some great offers just for entering, so everyone is a winner in that respect, but six people will reap even greater rewards. I wish you luck on the drawing! I'm pleased to announce that Age of War has made the long list for the 2018 BookNest Fantasy Award. Voting to create the shortlist will continue from now until Sunday 14th October. Nine popular Fantasy Blogs (Bookworm Blues, Fantasy Book Critic, Fantasy Book Review, Fantasy-Faction, Grimdark Magazine, The Fantasy Hive, The Fantasy Inn, The Grim Tidings Podcast & The Weatherwax Report), three big Fantasy Imprints (Gollancz, Harper Voyager & Orbit), and two well-respected Agents (John Jarrold & Joshua Bilmes of JABberwocky Literary Agency) helped to create the nominees. You don't need to vote for my book, but please do go and vote for your favorites. The full list of nominees in the Best Tradtiionally Publihsed Novel Category is presented here along with some data from Groodreads regarding how many books have been shelved, what people have rated the books, and how many ratings have come in. Any book on Goodreads with a rating higher than 4.3 is truly exceptional, so I highlighted some of those. Ten years ago on this day, October 1st, 2008, my first novel was released by a small press (Aspirations Media Incorporated) to the thunderous applause of crickets. Well that's not entirely true, the crickets didn't applaud, and if they had, even their scant numbers couldn't produce anything thunderous. Like almost everyone else, they didn’t take notice either. 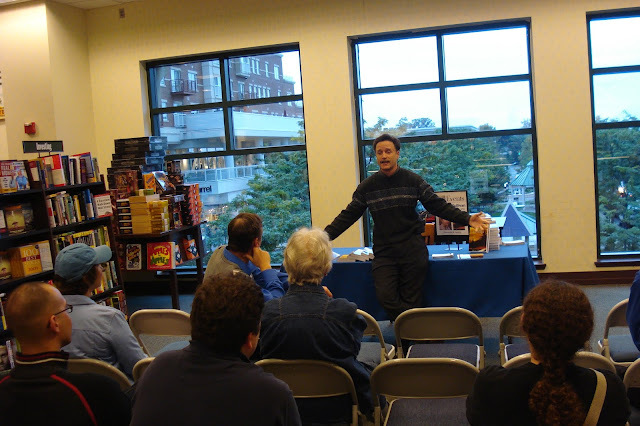 My release “event” was held at the Arlington Barnes & Noble. I expected a crowd, and there were twenty people, but I knew every one of them. Nearly all were from my writer’s group that met in the same bookstore, on that same night, on the same floor, in the same place. And yes, we planned it that way because if we hadn’t, I’d have been alone with my wife wondering if we could smuggle liquor into a bookstore. The Arlington Writer’s Group, better known as AWG, were quite gracious. They didn’t complain that I had hijacked their space, and they sat quietly listening to my very first public talk, which I can’t remember (such things are often erased from long-term memory for sanity’s sake). More important, nearly everyone bought a book and wanted me to sign their copies. I sat at a rickety folding table, sharpie in hand, as a line formed. I felt absolutely ridiculous. 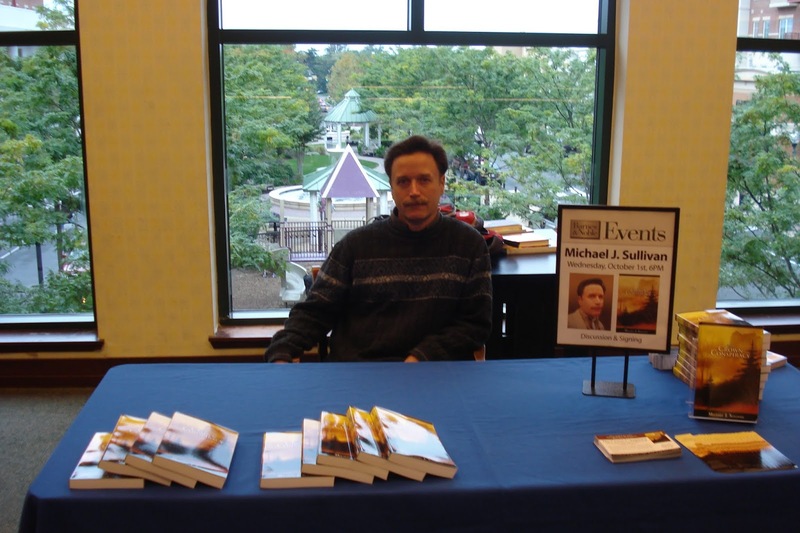 I was pretending to be an author. What got me through the event was that everyone else pretended, too. That was the first and last line I'd encounter for my signature during the next four years. The second time, my new publisher literally gave the books away to ensure a crowd. As it turns out, people line up for free stuff. For years, I considered myself "The Little Engine That Might." I had persistence, some decent stories (at least I thought they were), and most important of all a loving wife that made it her mission to see that I would succeed. Why? Well, it wasn't for money or fame that she worked so hard. It was so I could live a dream I'd had since I was a 13-year-old boy: To be able to write the stories I wanted to tell and hopefully have a few people read and enjoy them as well. It's taken a decade since that first released book (and thirty years and thirteen books prior to that), to get to where I am now, and I think it's safe to say I should upgrade from "That Might" to "Who Did." I've sold more than 1.5M books in the English language (and I have no idea how many in the foreign markets), but I do have dozens and dozens of contracts in so many languages I've lost track. I'm also proud to say that I'm now officially a New York Times Bestselling author. 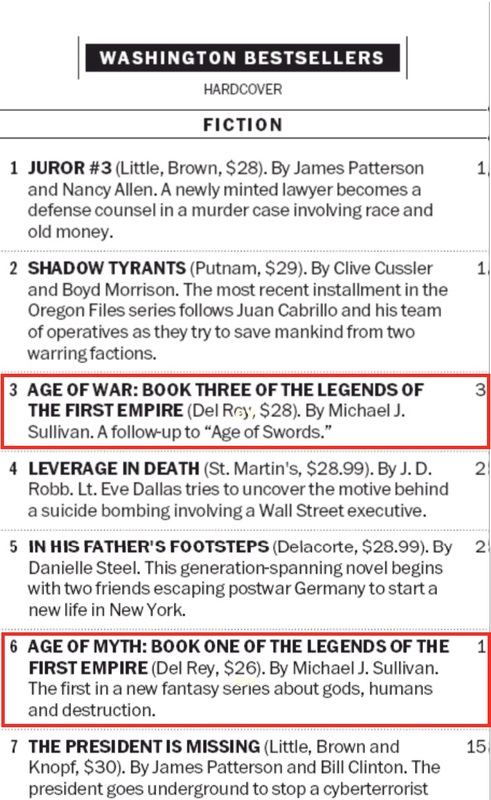 And last week, I had two books on the Washington Post’s Bestseller’s List. What a difference a decade makes! And of course, I can't end this post without thanking the most important people to my success. No, it's not my agents, or my editors, or the publishers who have picked me up and expanded my readership (although I am grateful to them as well). But who I'm speaking about is you, dear readers. It's because you took a chance on one of my books, then went back for more, and most important of all, the fact that you recommended them to others. I've always said that it's word of mouth that makes or breaks a book, and in many ways, it's your contributions that have gotten me where I am now (even more so than anything I or Robin have done). So I hope that you, too, share in this 10th anniversary celebration, after all, it's you who have truly made it such a success.